Whenever anyone gets excited about an electric car, I cringe. Electricity isn’t free and it certainly isn’t “green.” Why do electric cars get to call themselves “green” when electricity is created by burning coal in some cities? With all the excitement about electric cars, it seems like we are going to have a surge in demand for electricity. Fortunately, companies like Finavera are working on creating electricity from less polluting sources. They are harnessing the power of the ocean to create electricity. This sounds great, but what about the cost? The reason why companies burn coal or natural gas, is because it’s cheap. How much with Ocean Power cost? That’s a lofty goal considering how temperamental the ocean can be. Finavera lost their prototype buoy to the ocean. All of it sounds like pipe dreams right now, because they aren’t planning to be online until 2012. By then, we may be desperate for ANY clean electricity, despite the price. The couple looks so happy sharing their earbuds. The first time I ever saw anyone share earbuds, Mike and I were in Vegas. A busload of teenage girls were waiting for their bus while we waited in the taxi line. They were all quite noisy and excitable, as only teenage girls can be. One girl had a lime green iPod Mini. I had been coveting that very model of iPod. I watched as she offered an earbud to another girl. The other girl came in close and the two of them danced to the music. When I was a teenager, I never had a girlfriend that I would have shared an earbud with. I had plenty of guy friends that I would have shared with, but never a female friend that close. I had girlfriends, but never one THAT close. I felt the jealousy wash over me and I wanted an iPod more than ever. Our gadgets change us. Our gadgets motivate us. Our gadgets define us, no matter how much we want to deny it. The Aptera is out of research and development and is in the manufacturing stage now. For $500, you can reserve one now! Recently, the Apple Pro Keyboard that came with my iMac began acting strangely. It refuses to produce the letter “S” much of the time, and doubles other letters. It’s an old keyboard, and contains crumbs from many meals eaten at my desk, so I don’t blame Apple… but it’s time for a new keyboard. Apple’s latest keyboard is the sleek aluminum number shown here. While this is a beautiful keyboard and will no doubt win some design awards, I was underwhelmed when I tried one at the Apple Store. I prefer a keyboard with a bit of feedback—a “click” that I can feel as I press each key. Maybe even a noise. While Apple’s new keyboard looks great and works fine, it provides no feedback at all, and I was unable to accurately touch-type. For those like me who prefer a less “flat” typing experience, there are alternatives—although they aren’t always easy to find. Here are some suggestions for keyboards with a more tactile feel. The solution seemed obvious: since I liked my old Apple keyboard, I could just pick up another one of those. Unfortunately, when Apple introduces a new product, the older products have a tendency to disappear. The Apple Stores no longer sell the old clear plastic keyboards, and people with better planning skills than me have depleted the stock of most other stores. The only remaining source of these keyboards I’ve found is eBay, and the bidding for the last few remaining ones is intense. One alternative is the wireless Bluetooth version of the old keyboard, which doesn’t seem to be quite as scarce. I found several on eBay ranging from $30 to $50, and a local Best Buy had one sitting on the shelf. Old-school keyboard fanatics like me fondly remember the IBM Extended Keyboard that was available with some of the earliest PCs. This was the keyboard that established the popular QWERTY + navigation + keypad layout, and with its mechanical keyswitches, you never forgot whether you had pressed a key. Neither did your neighbors, since this was a very loud keyboard. You can’t easily find IBM keyboards these days, and they aren’t suitable for a Mac. One company, Matias, has tried to remedy this with the Tactile Pro 2.0 keyboard. It uses the same mechanical keyswitches, but it’s available in Apple White, complete with a USB 2.0 hub. I haven’t tried this keyboard, and at $149, I’m not about to buy one without trying it, but it might be just the thing for die-hard mechanical keyboard stalwarts. Searching every local computer store for a keyboard that looked and worked as good as my old Apple keyboard, I found one that is 95% of the way there. The Kensington Slimtype is a nice low-profile keyboard that still has a satisfying click to its keystrokes. It’s available both in a PC version and in the white Mac-style version shown here. The Mac version has the standard Apple layout of the Control, Option, and Command keys, although it also adds a Windows logo key for PC compatibility. For $30, this keyboard is widely available, feels almost as good as Apple’s old keyboards, and won’t look out of place next to your Mac. If all else fails, you can use any USB keyboard with your Mac, including those intended for PCs. While you won’t find sleek white styles or command keys on these models, you will find a variety of keyboards ranging from silent to noisy and from square to ergonomic at relatively low prices. 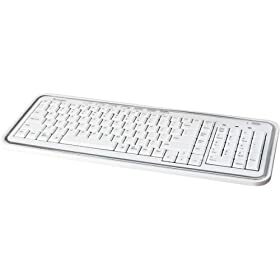 For example, the Microsoft Natural Keyboard 4000 shown here (previously reviewed) is hard to beat if you don’t mind hooking a keyboard from Redmond to your computer from Cupertino. To use a PC keyboard with the Mac, open System Preferences | Keyboard & Mouse and click Modifier Keys. This leads to a set of options to choose which function (Control, Caps Lock, Option, Command) is performed by each key. Using these options you can make the PC keyboard’s Alt key act as Command and its Windows key act as Option, matching the layout of Apple keyboards. My keyboard quest ended with a couple of lucky finds—I purchased the last remaining Apple Wireless Keyboard at a local Best Buy and the last remaining Apple USB Pro Keyboard at a local CompUSA. These will keep me happy for a while. If you’re not inclined to go on a quest for ancient Apple keyboards, I highly recommend the Kensington SlimType, which seems hard to beat for $30 and is available just about everywhere. The X-Mini capsule speaker is the solution for people who want volume from a laptop portable audio device that either doesnâ€™t have a speaker or has tiny speakers that arenâ€™t up to the job of delivering a wide dynamic response at reasonable listening volume. To be honest, I didnâ€™t expect to be impressed by this speakerâ€”I thought it would be too small to deliver sound any better than the built-in speakers on a laptop. But I was pretty astonished by the volume, the dynamic, and the vibrant sound that was not at all brassy. The speaker has quite a wide dynamic, especially considering its size. I tested it with my Sony Vaio UX390 (which has a crappy little speaker only appropriate for Windows â€œbongsâ€) and it solved the sound problem perfectly, making the little Sony useful for movie watching. The speaker is powered by USB but takes audio over a normal headphone jack, so you donâ€™t have to carry a power adapter for it or install drivers to use it. The rechargeable internal battery provides more than 7 hours of playback time when using it with iPods or portable CD players that donâ€™t have a USB port. The device recharges whenever it is connected to a USB port, and can be charged from a USB wall adapter (like the one that comes with iPods) or USB cigarette lighter adapter (like the one that comes with iPod car kits). The Sound is quite loudâ€”it will definitely fill a small roomâ€”and the dynamic response is fairly good. Bass response is excellent considering the size of the device. Bass response is quite warm and not at all â€œbrassyâ€ like most small speakers. Distortion is apparent in the top 10% of the volume range, but thatâ€™s likely louder that youâ€™d want anyway. The speaker is tiny and will fit in any laptop bag with no problemâ€”it actually takes less room than most headphones. It opens easily to expand its bass reverberation chamber, which is the secret to the bass response. You can clearly hear the difference in the warmth and volume of the sound when the speaker is opened versus closed. The only downside is that it is a single speaker, so of course it is monaural and wonâ€™t reproduce stereo sound. This makes it ideal as a supplemental bass speaker for a laptop or portable DVD player if your laptop will play through both the speakers and headphone jack at the same time (many will not however). You can get stereo sound by using two of these speakers and a â€œstereo to dual monaural adapterâ€ such as Radio-Shack catalog #: 274-375 (which is actually sold as a microphone combiner but will do the job). Donâ€™t confuse this with a headphone jack Y splitter, which provides the same stereo signal to both ports. The only way this device could be better would be if it had a mono jack for plugging a second X-Mini speaker into it for stereo sound (and that innovation would encourage owners to buy a second oneâ€”hint hint). Did AT&T Leak Apple’s Plan for a 3G iPhone? For all the love and joy that people have been spreading on the iPhone, it has received some criticism because the Internet browsing uses the EDGE network instead of 3G. I’ve been happy with the speed of the Internet browsing (it is faster than my Treo on Sprint), but there are a lot of speed freaks wishing for a 3G iPhone. Last week, Randall Stephenson, the CEO of AT&T, stated that Apple is going to release a 3G iPhone next year. To a lot of people, this seemed like an incredibly stupid move on AT&T’s part. It’s right before Christmas. Everyone who hasn’t gotten an iPhone yet was wishing Santa would bring one on Christmas day. Now, they are all just holding tight until the 3G version comes out. The 700-MHz wireless spectrum that Cringely is talking about is a chunk of the airwaves that are going up for auction soon. This part of the spectrum used to be used for analog television (channels 52-69 on UHF). They will no longer be used because of the FCC ruling that forced all the television stations to start broadcasting in the digital spectrum. Companies are jumping all over themselves to get this piece of the crowded airspace. I think there has been too much analyzing and watching every word of every executive in the gadget industry. Sorry, AT&T didn’t “leak” a 3G phone right before Christmas to send Apple a message. They’re just spouting the party line put down by Steve Jobs two months earlier. In northern Japan, they have carved specific grooves into the road to create a melody. Melody roads? Really? That’s the best you can come up with that technology? Come on, even I can think of something better. 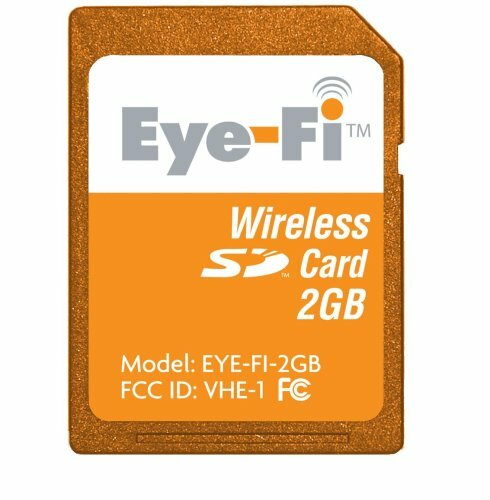 I’ve heard a lot of drooling about the Eye-Fi Card. It’s supposed to be a cool wireless SD card that can upload your photos to the Internet without the use of a laptop. I couldn’t understand why everyone was so excited about it because it looked like a $100 complication, not a simplification. I’m glad to know that my instincts were spot on. The Eye-Fi has to be configured with each local network you use and you it can only be configured via the Eye-FI USB dongle. Worse the Eye-Fi software canâ€™t play with most hotspots, free and hotel wifi points. So much for photos on-the-go without the laptop which was my primary desire. The real let-down to me, however, is that the upload from camera to photo sharing site (in my case Flickr) will upload every picture on the card. You cannot limit it to just some. Iâ€™m too bad a photographers for that. Also the Eye-Fi currently does not support any of the config settings I use with Flickr, so all titles, descriptions, tags, and groupings have to be done manually at Flickr.com which i find to be time consuming. It uploads EVERY photo on your card?! That is completely unacceptable to me. There are so many photos that I take trying to get just one good shot. That one good shot goes to Flickr, not the whole collection! Thanks for the review, Ted. You’ve saved a bunch of people from an expensive mistake. I LOVE this web ad! The fact that it showed up right next to a Dell review is just icing on the cake! These ads are genius. Leopard has had a few problems and I haven’t upgraded to it yet. Vista, on the other hand, is the reason I switched to a Mac in the first place. Here is an old commercial for the Lisa computer from Apple, starring Kevin Costner. Those who use computers and those use Apples. Apple has increased in popularity recently and the Windows Vista fiasco has convinced quite a few people to switch (including me), but I don’t think that the world has been polarized. People still consider Apples to be computers, mostly because Windows adopted the mouse and GUI interface quite quickly.